BB: Tell us how The Jam Salves started. KR: Each year for Christmas, we bake our friends a compilation of sweets as a way of telling them we love them without spending a fortune. In December of 2014, we decided that we didn’t want to give everyone diabetes again this year, so we were trying to think of something small we could give to each of our friends. 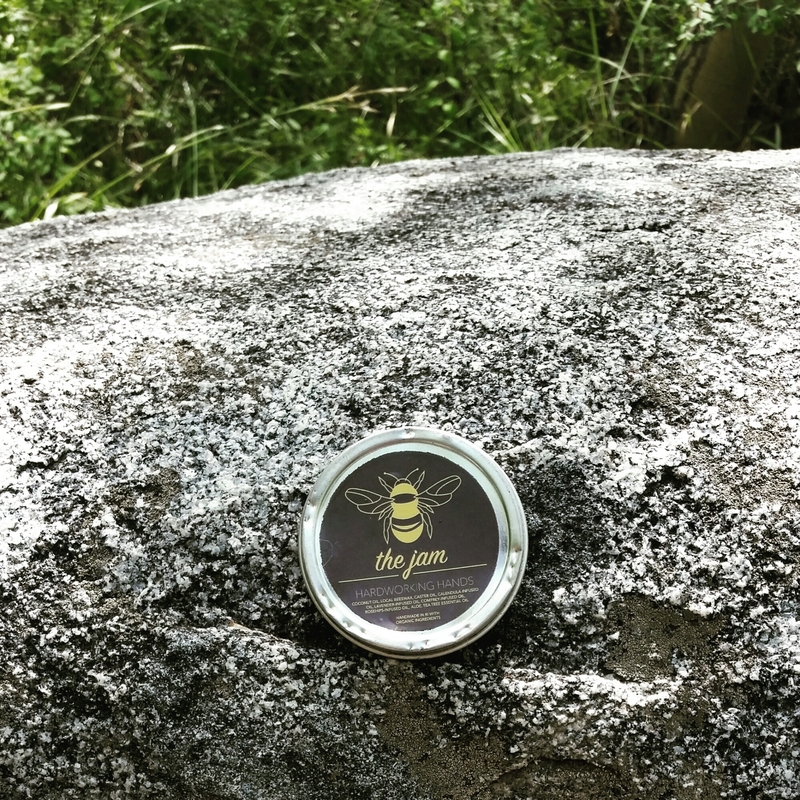 Since most of our friends are climbers, we thought about trying to make our own salves, as we all used salves to soothe our skin after a session in the woods or gym. Our gift giving endeavor ended up being a lot of fun. We had a large Yankee Swap Christmas party in our tiny apartment and gave each of our friends a salve. We made two different recipes and put different color lines on them to differentiate. Once we realized how much we enjoyed making the salves, we began to think about the possibility of trying to start our own business. We had our friends report to us with feedback about their presents, which helped us to develop our final formula. From there, we spent time perfecting that formula, and handed out more samples for people to test. Eventually, we felt confident enough with our products that we offered samples to local climbing gyms, and the rest is history. BB: What an awesome origin story – from your friends’ Christmas stockings to etsy and local climbing gym shelves! What sets apart The Jam Salves from other similar products out there? KR: I think there are two reasons: The first is that I believe our products truly work, but aren’t as greasy as some other salves on the market. One thing I hated about using salves before was that I felt like I couldn’t touch anything for twenty minutes after application. While some grease is in the nature of the product, I feel that ours aren’t nearly as greasy as others. The second is that we use more herbs than other salve makers. They generally use calendula and comfrey, but rarely do you see the rosehips and lavender; lavender is especially useful because it dulls the nerve endings when you’re in pain. BB: We’re huge fans of the feminine but bold fragrance of The Tendon One (Bouldering Babes official climbing salve of choice). What inspired this formula? KR: Honestly, I didn’t want to use the same essential oil fragrance for the Tendon One as we did the Hardworking Hands because I thought it would be more interesting if they were different. I love lavender, everything about it, so I thought it only natural that we use it for one of the salves. BB: What’s next for The Jam Salves? KR: I would just love to get our name out there. I really do believe in our product – I use it every day, and I know first hand that it works. 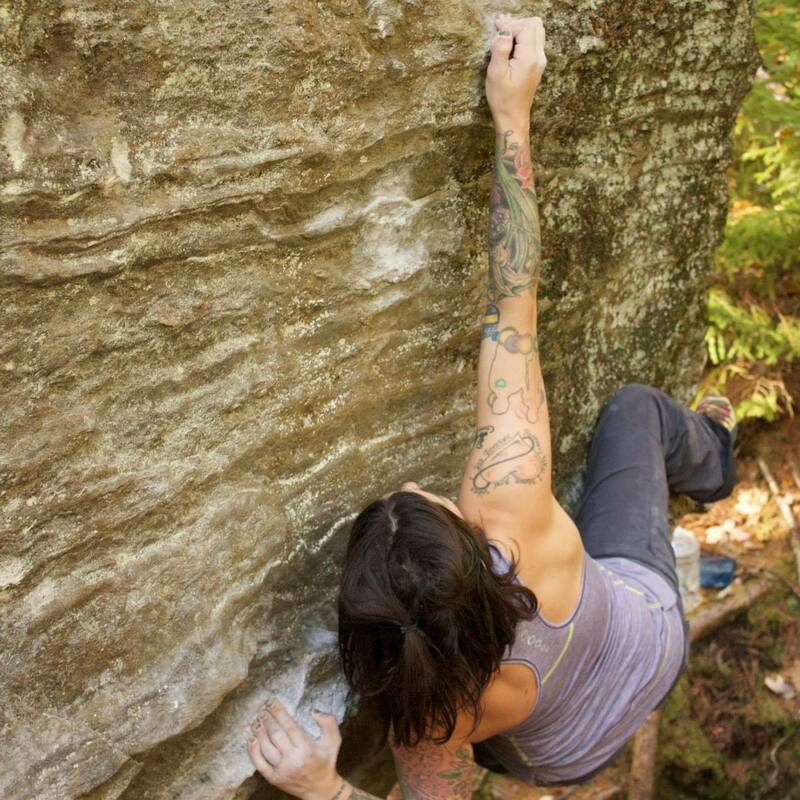 This summer I was in Squamish and my hands were thrashed; I didn’t know how I’d be able to continue bouldering the next day. I used our salve several times throughout the night, and come morning, I was able to get back out there. I’m not interested in being rich from this endeavor – I’m a teacher, I never plan on being rich. I just want to help people get their climb on as frequently as they want! BB: Speaking of which, tell us a little more about the lady behind the brand and how your love affair with rock climbing began. How has it shaped who you are today? KR: I’ve been an athlete my entire life, though that fell off a bit in my early twenties when I was focused on school, work, and a social life. I didn’t have a sport that kept my interest enough to make room for it. One of my oldest friends started rock climbing when I was in graduate school, and he told me repeatedly how much I would be into it. I had very little time then, so when I finished, I tried climbing. The very first night, I knew things in my life were going to be forever changed. Climbing has given my life direction; it’s how I grew to know and fall in love with my husband. Despite how busy I am, I always need to find time for climbing. I climbed until 5 days before I gave birth to my daughter; my shoes were so tight around my water-filled feet, that my ankles drooped over my shoes, which my husband had to force onto my feet. I feel like I spend my time doing something worthwhile, adventurous, and meaningful to my soul. BB: Do you see climbing as a metaphor for empowerment? How has this manifested itself in your own life? KR: Absolutely. Rock climbing is unbelievably difficult. I’ve said before, not in a cocky way, that rock climbing was the first sport I tried that I wasn’t instantly good at. It requires more than just strength; one must develop technique, route reading and problem solving skills, patience, persistence, and a tolerance for pain and bodily abuse. Conquering these feats undoubtedly leads to empowerment. If one can combat the physical and mental challenges of rock climbing – I hadn’t even mentioned the fear and labor involved when you begin climbing outside – one can surely do most things dreamt of. Every single person who climbs should be proud of herself/himself, and then take those feelings and transfer them to all aspects of life. BB: Why do you think rock climbing attracts more women than before? KR: I think it’s in part because the sport itself is growing, especially in mainstream media due to people like Alex Honnold and Tommy Caldwell. The growing numbers of climbing gyms, I’m sure, is helping as well. But most of all, I think women are over being told what they can or can’t do, and want to experience adventure outside of the norm. More women aren’t afraid of being strong and are embracing the opportunity. I say go for it! BB: How do you think the sport has changed as a result? KR: I think amazing women like Lynn Hill, Sasha Digiulian, and Hazel Findlay have paved the way for women’s success in climbing. On the surface, climbing is a strength-based sport, and because of that, people ultimately associate it with men. The notion that women can be as strong as, or stronger than men, is quite recent. I think true respect and admiration is being delivered to many women across the globe, and if people can give respect to women for a sport like climbing, I think it’s only a matter of time before people can issue that same respect for women in other aspects of life. 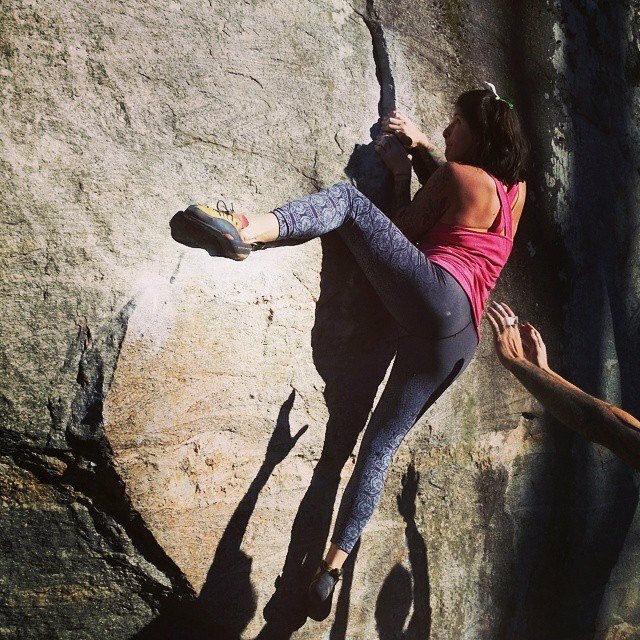 BB: We’re totally inspired by you as a female entrepreneur, boulderer, full-time mom and teacher. What advice would you give to women who doubt they can have it all? KR: Don’t ever doubt. You are the maker/decider/dictator of your own life and abilities. You can only do as much as you allow, but you can do whatever you want. Everything we do in life is a choice; as corny as this sounds, you should choose yourself. If you want to try something, do it. Maybe that means moderating parts of your life, but they say everything is good in moderation, so prove them right.